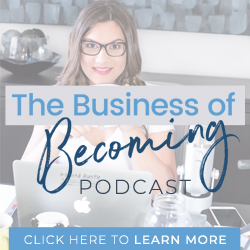 I was so honoured to have this week’s guest join me on the podcast, Jessica Hefele was one of the first employees I hired in my business and she joined at a really pivotal point in my business and life, so beyond sharing some of our top tips to hosting live events, you’re also going to get some personal behind the scenes glimpses into some of my past live events and how things have changed over the years. We also talk about the evolution of Jessica’s career path from graduating with a degree in Psychology (which she completed in German!) to becoming a holistic nutritionist and joining The Wellness Business Academy to quickly learning that she wasn’t meant to create a signature program but wanted to use her skills and talents in a different way to support health and wellness professionals. Since then she’s gone out on her own to create Jessica Hefele Events and now works with some of the biggest names in the biz to support entrepreneurs to create epic events. And of course, we walk through the 5 main areas we think you need to consider when planning a live event – whether it’s a 3 hour workshop or a 3 day retreat or conference, you’re going to want to download the Event Planning Checklist we created to accompany this event so that you can take notes. Why you need to expand your idea of what it means to work in the health and wellness industry to find your place. Some funny stories about what happened when Jessica and I lived in The Four Seasons for a week! HINT: It wasn’t fancy! My personal 3 most important components that I use to “judge” an event – there will be no don’t after listening that I’m a very sensory person!